The PGA Championship is one of golf's four major championships. It is played yearly at different courses and hosted by the Professional Golfers Association, a k a the PGA of America. The tournament is 72 holes of stroke play and the field includes, in addition to top tour golfers, 20 PGA club professionals who play their way in through a national championship tournament. The PGA Championship was first played in 1916. The PGA Championship, in its modern history, has traditionally been played in August and is the last of the four majors on the golf calendar. Beginning in 2019, however, the tournament will move to May and fall in-between The Masters and the U.S. Open on the majors calendar. Where: Bethpage State Park (Black Course) in Farmingdale, N.Y.
At Bellerive Country Club in Missouri, Brooks Koepka set or tied tournament scoring records to hold off a charging Tiger Woods and win the major. Koepka finished with a two-stroke victory over Woods, who was trying to win his first major in 10 years. For Koepka, it was his third career major championship victory—and his third win in the last five majors he played. The tournament was forced to a 36-hole final day due to inclement weather, and the golfer who emerged after that marathon was Jimmy Walker. In fact, after opening with a 65 in Round 1, it was a wire-to-wire win for Walker. He topped defending champ Jason Day, the runner-up, by one stroke. Check the list of winners through the years, going back to the first PGA Championship in 1916. Click on the year of the tournament to view the scores and read a recap of that year's event. Like at The Masters, at the PGA Championship every year there is a Champions Dinner. What's on the menu? And did you know that defending PGA champs also give gifts when they host the dinner? When and where was the tournament first played? Who has won it most often? What is the cut rule and playoff format? 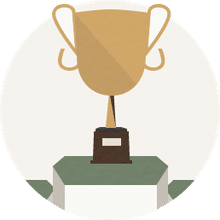 Why is the trophy named what it is? Find answers to these questions and more. What is the PGA Championship cut rule? What is the PGA Championship playoff format? Look through this interesting list of tournament records. You're sure to find some interesting facts. 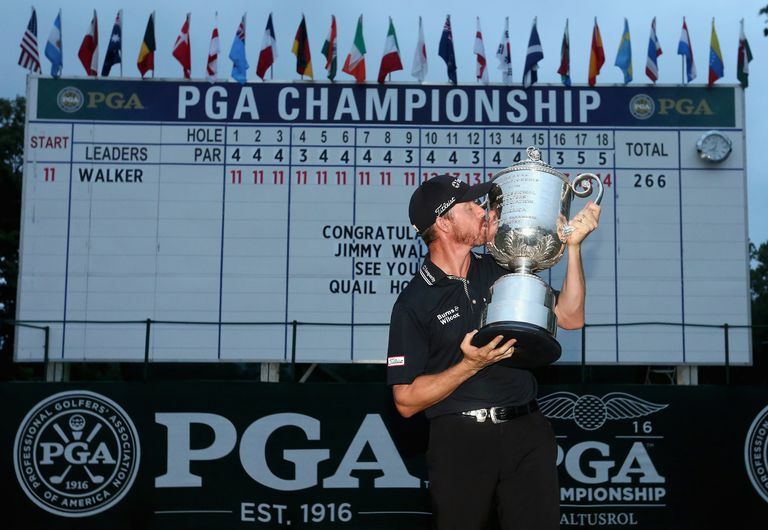 Where has each PGA Championship been played? See the list of championship golf courses. 2019: Bethpage State Park (Black Course), Farmingdale, N.Y.
2020: TPC Harding Park, San Francisco, Calif.
2022: Trump National Bedminster, Bedminster Township, N.J. The top 20 finishers from the current-year PGA Professional Championship (these are the 20 club professionals in the field). The top 70 players who have earned the most PGA Championship points over the previous one-year period (points based on PGA Tour money earnings). Playing members of the last named U.S. and European Ryder Cup teams provided they remain within the top 100 on the Official World Golf Rankings as of the specified cut-off date (approximately one month prior to PGA Championship). Winners of PGA Tour co-sponsored or approved tournaments, whose victories are considered official, from last year's PGA Championship to the current-year one. In Olympic years, the gold medal winner in the golf from the Summer Olympics. Any other golfer not otherwise qualified but invited by the PGA of America. If necessary to complete the field, those players beyond the top 70 players who have earned the most PGA Championship points (No. 8), in order of their position on such list.